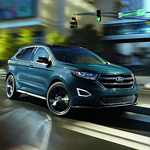 The 2019 Edge is one of the top midsize SUVs, according to US News & World Report. There are two trims available, including the standard 2.0-liter four-cylinder that's been turbocharged. Despite this base power, the SUV still gets a lot of fuel efficiency, according to drivers. The Edge is rated for 29 mpg on the highway. However, you can keep a firm control on your fuel efficiency with the vehicle's on-dash fuel monitor. There are a lot of other things to like about the Edge, including the upgrades. Want more power? Upgrade to the Edge ST, which delivers 335 horsepower with a twin-turbocharged V6. All models have an eight-speed automatic transmission. The suspension and handling are all new as well, which contributes to smooth handling and tight steering, allowing you to take turns and curvy roads with ease. Want to check out the all new Edge? Stop by Mullinax Ford of Kissimmee for more information.